Our friends from The Yoga Mandala came by for our first ever Acroyoga ACROVINYASA Workshop! 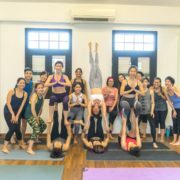 Leading the class was Sara Wee and Rachel Ng, who led us from solo vinyasas, to (erm) team-bonding activities, and finally with partner inversions and acroyoga. A happy group of 15 SURFSET regulars turned up to get stacked and get jacked. Sara did promise that things may get chaotic during the session, and boy it did. Lots of triumphant high-fives, spotters rushing to catch a fall, nervous laughter, flat-out laughter, and the occasional scream. Needless to say, we all had great fun. Shuyi had the foresight to get her husband help film a short video for the enjoyment of everyone. Here it goes! Acroyoga is a sort of yoga abomination – we say that because we’re so used to having the peaceful, dependable earth beneath our bodies for regular yoga. Acroyoga? You throw that out the window, and opt to have a flimsy human below you instead. What? Why?